Friends, nothing is absolute in life. No one product is a panacea, and there is no ‘best’ anything, especially given the different kinds of human beings we all tend to be, with different conditions, dispositions, sizes, and complexions. Plus, time changes all superlatives. The experience of any one product is what can be judged, for what it’s worth to the inquiring public. Excepting the inherent need for personal trial and error, there are some products that shine a little brighter, objectively. I spent some time in the basement of Barney’s in Chicago last weekend, and I was introduced to Sunday Riley. I left with a bottle of Ceramic Slip, a gel-based clay cleanser that is meant for those with normal to oily skin. For one, the scent is heavenly, thanks to essential oils of neroli, black pepper, jasmine, frankincense, and sandalwood. Not too heavy, but specific enough to indicate you’re rubbing something expensive on your face. And it is, at $45. Not Creme-de-LA-MER, but not a bargain. After I use it each night, I feel firm, cleansed not dehydrated, and primed for a little cold cream. For that, I got a sample of Sunday Riley’s Good Genes, which uses lactic acid and yeast to plump and firm the top most layer of skin. That purchase will require a bit of working up to, as it is more than twice that of the cleanser ($105). A thorough vetting will take longer than a week, but first impressions are good. 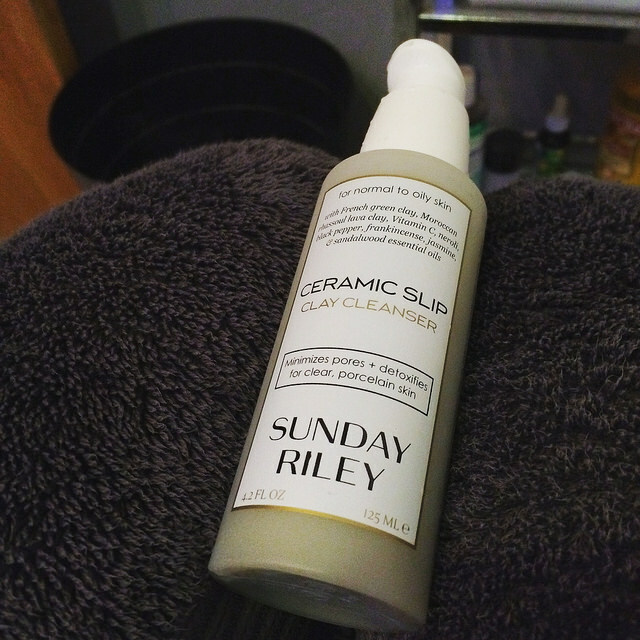 And silly as it may seem, the branding of Sunday Riley’s products are sleek and luxurious in black, white, and gold. Only launched in 2009, the Houston-based line is now sold across high-end department stores and at Sephora in the US, and Space.NK in Europe.